pojemność: ampoules x 5ml/0,17 fl.oz. Restore beautiful look and strength of your hair! 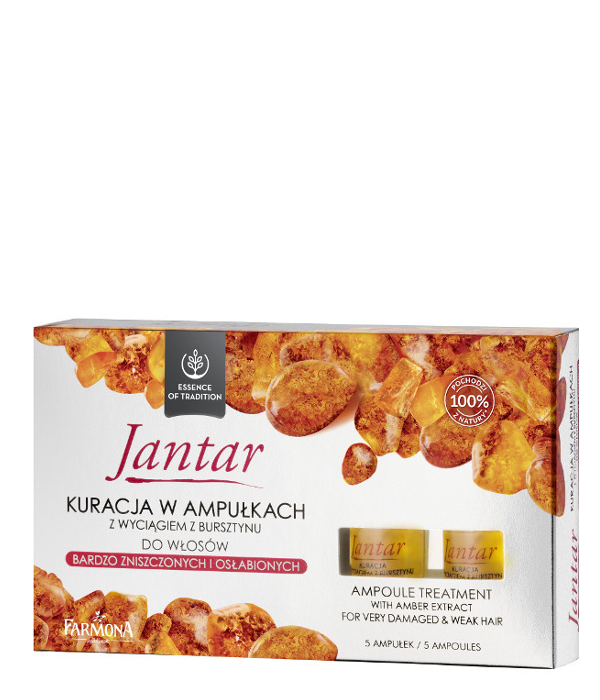 Jantar ampoule treatment is based on a verified and effective formula. It is a result of a long tradition of using the unique properties of amber. 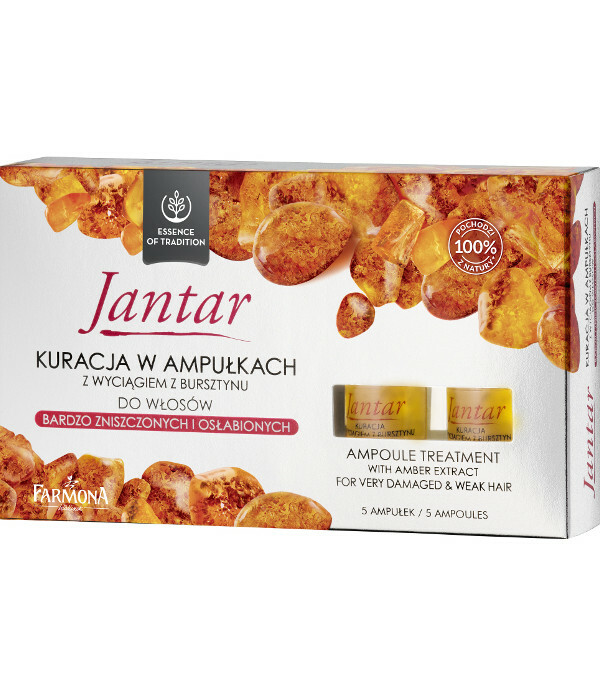 Usage: apply the contents of the ampoule to the scalp and massage. Do not rinse off. Use 2 times per week, until getting visible improvement in the hair condition, and then use once a week to maintain the effect. 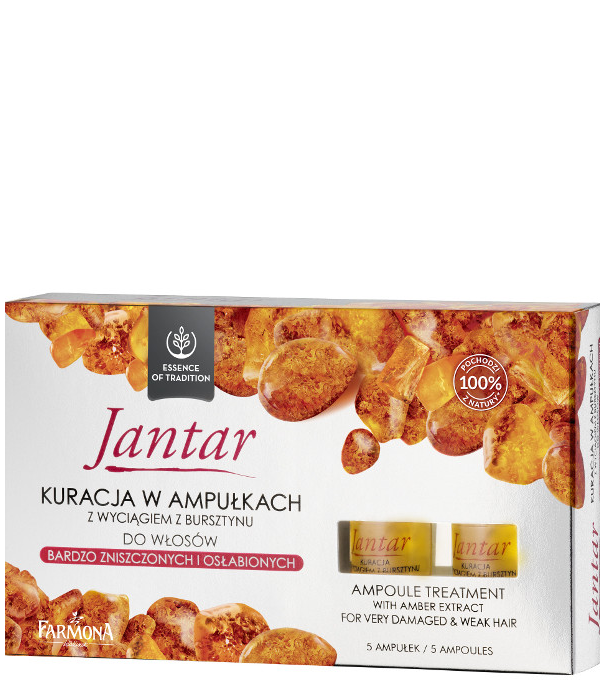 For best results we recommend the systematic use of ampoules, along with other products from line Jantar for damaged hair. Aqua (Water), Alcohol Denat., Glycerin, Propylene Glycol, Amber Extract, Glucose, Panax Ginseng Root Extract, Arginine, Acetyl Tyrosine, Arctium Majus Root Extract, Hydrolyzed Soy Protein, Polyquaternium-11, PEG-12 Dimethicone, Calcium Pantothenate, Zinc Gluconate, Niacinamide, Ornithine HCl, Citrulline, Glucosamine HCl, Biotin, Hydrolyzed Silk, Lactic Acid, Glycolic Acid, Citric Acid, Malic Acid, Salicylic Acid, Polysorbate 20, PEG-20 Glyceryl Laurate, Tocopherol, Linoleic Acid, Retinyl Palmitate, PEG-40 Hydrogenated Castor Oil, Diazolidinyl Urea, Iodopropynyl Butylcarbamate, Caramel, Parfum (Fragrance),Limonene,Linalool,Hexyl Cinnamal.